Home | Gifts | San Francisco Giants 2014 World Series Champions Gifts and More! | OYO SALE! 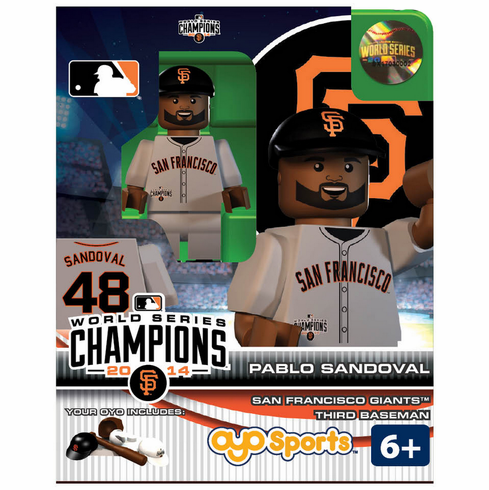 Pablo Sandoval - San Francisco Giants Special Edition 2014 World Series Champions OYO Mini Figure! Special �World Series Champions 2014� Packaging includes 2014 World Series Champs artwork on the front and back of the OYO package. Officially licensed building-toy figures of your favorite MLB player with rotating arms, bending knees, and player likeliness. Comes with bat, gripping ball, glove, and stand. Compatible with most other brand name building toys. Collect. Build. Play. Collect your favorite players. It's like a 3-D baseball card!